Vintage buffet made by the Shelbyville Wardrobe Mfg Co. in Shelbyville, In. Dating to the 1940's this vintage piece features multiple different types of wood on the face of the buffet to create a unique look. The panels on the cabinet front pull a light green hue in contrast to the rest of the piece. Featuring round bun style feet and reeded columns that ascend the cabinet base. Three storage drawers along with the cabinet will give you plenty of storage options without taking up an abundance of space. The brass drawer and door pulls are original to the piece. 45" x 18" x 38.25"
*Overall, the piece does have some veneer damage and the original urn details have been removed therefore the price has been reduced around 30% from original pricing. 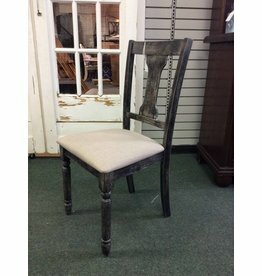 Brand new dining chair with gray/burntwood finish and beige upholstered seat.